In South Sudan, food insecurity continues to deteriorate to Emergency (IPC Phase 4) due to displacement, restrictions on movement and trade flows, and limited access to normal livelihoods activities. As measured on the latest Integrated Food Security Phase Classification (IPC), 63 per cent of the total population is expected to face severe food insecurity in the absence of comprehensive humanitarian assistance in the period May to July 2018 and nearly 261 500 children will suffer from severe acute malnutrition, out of which at least 10 to 20 per cent are expected to develop medical complications associated with SAM. To reduce the health impact of the current nutrition emergency in areas with the highest burden of acute malnutrition, WHO through its integrated health, nutrition and water, sanitation and hygiene (WASH) interventions is improving the treatment of severe acute malnutrition (SAM) with medical complications in stabilization centers (SC). “Treatment of acute malnutrition requires multi-sectoral approach including the provision of quality healthcare services and supplies, safe water, improved sanitation and proper hygiene services”, says Ms Marina Adrianopoli, Technical Officer for Nutrition at the WHO South Sudan. In an effort to close child survival gaps, the World Health Organization (WHO) in collaboration with the nutrition cluster is providing comprehensive training of trainers (ToT) on management of severe acute malnutrition (SAM) with medical complications (MC), water quality control system, psychosocial support to caretakers of admitted children and monitoring/supporting functionality and quality of SC services in former Western Bahr el Ghazal and Warrap states. 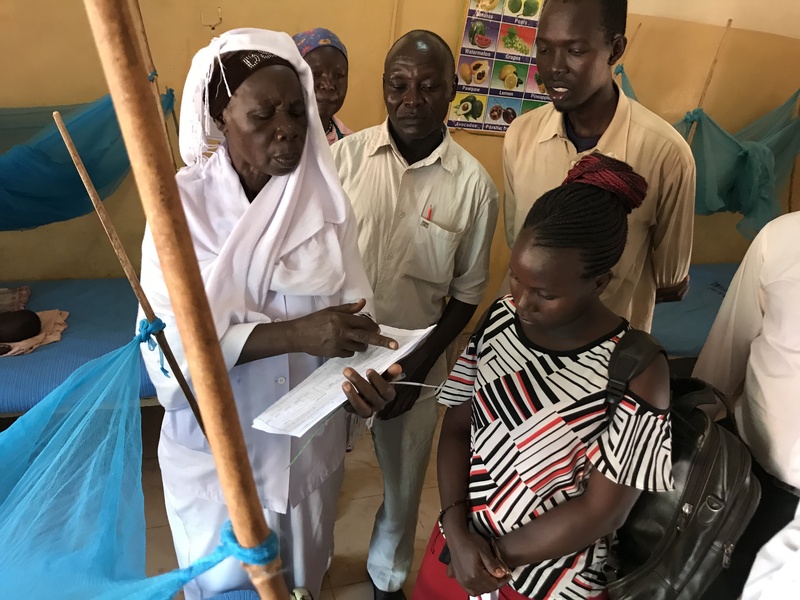 This ToT which brought together 17 health workers from six nutritional stabilization centers in Western Bahr el Ghazal and Warrap aimed at improving the quality of services in nutrition stabilization centers and reducing the death rate resulting from the mismanagement of SAM cases. The trainings are part of a program designed by WHO in coordination with the health authorities and nutrition cluster to respond to the food security crisis and build the capacity of the Ministry of Health and partners nutrition cadres to roll out the new National Guidelines on Inpatient Management of SAM/MC, expand the training program using national facilitators and increase the efficiency and effective day-to-day running of stabilization centers across the country. 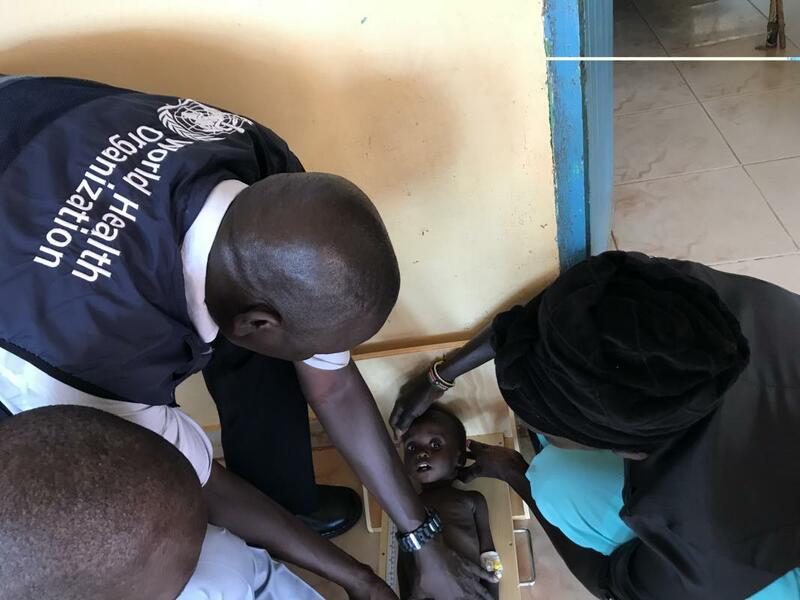 Thanks to the continued support of our donor – the South Sudan Humanitarian Fund (SSHF), “the trainings are lifesaving interventions for early identification, referral and timely treatment of malnourished children” says Mr Evans Liyosi, WHO Representative a.i. for South Sudan. By the end of September 2018, about 4 704 children and care takers are expected to benefit from the services provided by WHO and partners. 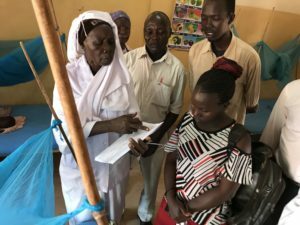 In addition to the ToT conducted for partners operating in Unity, Western Bahr el Ghazal and Warrap another three training courses on management of acute malnutrition with medical complications will be cascaded for a total of 80 participants from the former Jonglei and Eastern Equatoria States. As a way of monitoring progress throughout treatment, WHO Stabilization Center Functionality Monitoring Tool, has been introduced to explore key aspects on the quality of care in stabilization centers, to identify challenges in the delivery of inpatient medical and nutritional care, focusing on ward setup and structure, availability of supplies, job aides, equipment and staff. The tool also helps to address challenges through immediate and medium-term actions and promotes results-oriented activities. In order to provide treatment to severely malnourished children suffering from medical complications, WHO also distributes SAM kits to Wau Teaching hospital, Wau PoC clinic, and Raja Hospital to support affected population in counties with high rates of Global Acute Malnutrition (GAM), in the former Western Bahr el Ghazal State. The WHO SAM kit includes antibiotics, antifungal, de-worming, antimalarial and anti-scabies medicines, and a rehydration mix specific to treat cases of SAM.